There are a variety of "Brain Boosters" on the market today. Many people associate memory loss with the aging process, but whether your concern is forgetfulness or short-term memory loss, one must be aware that there are very specific factors involved that can cause the problem, even at a young age. So, instead of simply attributing this to a natural decline in cognitive functioning, other factors must be considered. Other causes could be drug or tobacco abuse, alcohol abuse, certain medications, stress and depression, nutritional deficiency, sleeplessness, stroke, head injury and dementia. Our brains can create new brain cells at any age, and diet plays a key role in how often, and how effectively they can do so. Whole foods contain many properties that help to keep our minds in pretty good shape, and studies show that the herbs contained in this combination formula may help to increase circulation in the brain, stimulating to the cerebral cortex and they help to oxygenate the brain. This process can be useful for improving recall, increasing mental activity and alertness. Ginkgo leaf is one herb that is known to actually help regenerate brain cells. 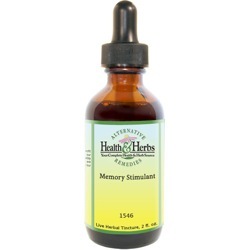 Numerous studies have found that the herb is beneficial for improving memory and cognitive function. Researchers believe that this action is due to its ability to promote blood circulation to the brain and protecting it from neuron damage. The plant has a number of therapeutic properties and contains high levels of flavonoids and terpenoids. These antioxidants provide protection against oxidative cell damage from harmful free radicals that can contribute to health disorders, such as dementia and Alzheimer's disease. In particular, Ginkgo biloba extracts potency aids in memory, improved thinking, and better social behavior. Ginkgo biloba leaf is also believed to help alleviate the symptoms of general anxiety disorder, and possibly seasonal depression, panic attacks, and social phobias. Gotu Kola leaf (Centella Asiatica) is considered to be an adaptogen and has been suggested by herbalists to boost brain power and lower stress. Stress can have a bad effect on our brain's ability to process information, and to see things clearly. Known as mandukaparni in Sanskrit, it has been used to balance the brain and believed to help in all aspects of brain functioning. A review of the herb, in Ayu, found that Gotu Kola leaf extracts neuroprotective properties may help to treat deficits associated with Alzheimer's disease, Parkinson's disease, and oxidative stress. Eleutherococcus Senticosus, also known as Eleuthero, has been used to restore energy and vitality. The herb has gained a reputation for its numerous benefits for good health. It is now a widely used herb to help improve memory and increase longevity. It has been used during convalescence, for physical and mental stress, geriatric debility, and a wealth of other issues. It has been used for over 2000 years as a folk remedy for heart ailments, rheumatism, to promote healthy appetite, and increase stamina. Eleuthero root tincture helps the body to adapt to stress, in a good way, it makes the stress response more efficient, helping you stay clear-headed when under pressure. The herb's popular use is to increase mental alertness, help with sustained energy levels over long-term, and without the energy rollercoaster of energy drinks or other caffeine stimulants. Fo-Ti Root, like many other medicinal plants, has an endless number of unique phytochemical compounds that produce some pretty amazing results for health. We consider Fo-ti to be an energy food because it helps to improve mental clarity, memory, and cognitive function. And most find there is no reason to complain about tiredness and fatigue once they regain mental clarity. Non-Alcohol: Ginkgo Leaf, Gotu Kola, Eleutherococcus Senticosus, Fo Ti Root, Structured Water and Vegetable Glycerin. Instructions: Use 6-12 drops in juice, water, tea, or under the tongue. May be taken 3 times daily. Shake well, Store in a cool, dry place. Keep out of reach of children.